The average precipitation in Moab for May is 0.8 inches of rain…I think I witnessed most of it the last two days. Saturday, however, was simply glorious…sunny with a cool breeze. 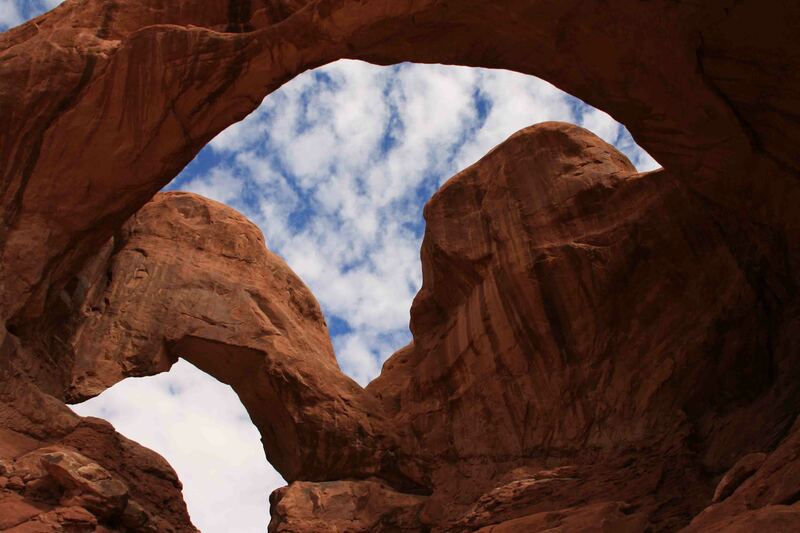 The weather and weekend invited plenty of visitors to the Arches National Park. It required some patience, quick reflexes, and geometry to snap photos of the arches without people in them. I understand wanting to stand beneath the arches to look up in awe, but enjoy them and move on so others can do the same. It seemed like one couple sat down for a picnic in the middle of an arch which left others waiting tirelessly for a photo without them in it! I believe I may have found a new, favorite…Delicate Arch. The pamphlet claimed the hike to the arch was best at sunset. Arriving first thing in the morning to see the snow capped mountains looming behind it or at a different angle to catch the moon between the arch was pretty spectacular. Even with twenty other people nearby, it was so serene and awesome at the same time. I took the roundtrip three mile hike to Delicate Arch, beginning before 8 am because I wanted to beat the crowds, and later stopped at the lower viewpoint, which was lackluster at best. For any new visitors to the Arches National Park, I’d suggest saving the best for last. Presuming a good weather forecast, I’d go at sunset, stop at the lower viewpoint for an uneventful view and then take the walk that is mostly uphill to this fantastic sight. This path leads past Wolfe Ranch settled by John Wolfe in the late 1800’s. He and his son Fred moved from Ohio and chose 100 acres of land along Salt Wash for its water and grassland. The men built a one-room cabin, corral, and small dam where they lived for a decade. Wolfe’s daughter and her family moved to the ranch in 1906 and convinced her father to build a better cabin, still standing today, with a wood floor. Just a few hundred yards from the ranch, a short U shaped path directed visitors past Ute petroglyphs. The horse and rider, big horn sheep, and dog-like animal were carved between 1650 and 1850 AD. The wide, gravel path ascended past different, gray-colored hills and up to a slanted rock face, where the skill of connecting the cairns began as hikers passed by an occasional wildflower growing between crevices. The trail then wound along a rock ledge to views of a variety of arches before all of a sudden it opened to the Delicate Arch…magnificent! The arch has inspired names like Cowboy Chaps and Old Maid’s Bloomers. The free-standing arch, composed mostly of Entrada Sandstone, has an opening 45 feet high and 33 feet wide. The parking lot was full upon my return at 9 in the morning! Petey, VANilla, and I stopped at a few overlooks, including the Garden of Eden and then proceeded to explore Double Arch, Turret Arch, and North and South Windows. After selecting one of the last parking spaces, I made a quick stroll to Double Arch which I also found amazing. The larger opening has a span of 144 feet (the third longest in the park) and a height of 112 feet (the tallest in the park). After my quick jaunt to Double Arch, I passed through the parking lot to take a mile-long amble past Turret Arch and North and South Windows. It proved to be impossible to get a shot of the Windows at the preferred angle without a person in the South Window, but I guess it gives the perspective of how large the spans are. As I was returning from the “primitive portion” of the loop that required only 50 feet of “rock travel” a poor lady had fallen and was being assisted by rangers and the EMS. It looked like she broke her ankle. For her sake, I hope she was at least at the end of her vacation versus just beginning it. Before departing the park for the day, we made brief stops at Balanced Rock and the La Sal Mountains Viewpoint which provided an overlook of a variety of formations with names such as Sheep Rock, Three Gossips, Tower of Babel and the Organ. I spent the afternoon taking advantage of the showers at the Moab Recreation Center and the wifi at the Moab Library before loading up on groceries and turning southwest toward Torrey. I love the long days, as I was able to make the nearly three-hour drive through daylight and dusk. The terrain was fascinating. We passed by grey buttes that looked almost like they had been mined with dirt cones beneath them, snow capped mountains, farmland, orchards, cream colored boulders sprinkled with chocolate-colored rocks that looked like a cupcake with sprinkles, and towering red sandstone formations. I finally stopped to take some pictures in Capitol Reef National Park. I thought I was passing by the park, I didn’t know I’d be passing through the park to get to Torrey, or perhaps I would have allotted more time. We stopped at the Behunin Cabin, built by Elijah Behunin in 1882. The one room cabin was home to a family of ten! The parents and the two youngest children slept in the cabin, while the boys slept in a dugout in the cliff, and the girls made their bed in a wagon box. Another interesting travel blog with phenomenal photos. The photos themselves speak volumes. How long ARE you guys touring? Until the end of October weather permitting…makes a full year. Perhaps I should just post bigger photos and skip the dialog! Love the Moab area. There are some great hikes but you have to know where to go. I went biking there years ago. Hope you hit Lake Powell. I am in the Atlanta airport waiting for a flight to Nashville. Off to Tyler, Tx to judge next week.